Maryland man charged with accepting ISIS funds to carry out terror attack. 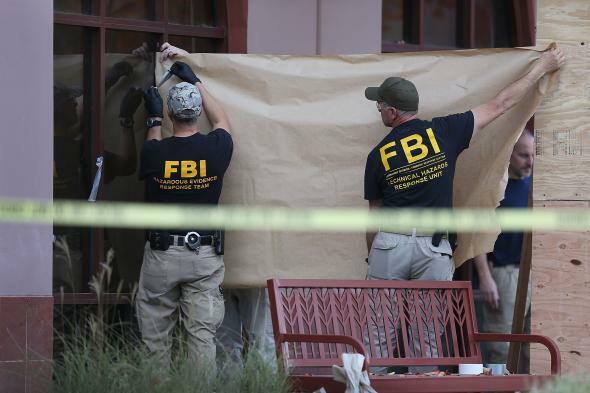 FBI agents investigate the building at the Inland Regional Center were 14 people were killed on December 7, 2015 in San Bernardino, California. A Maryland man has been charged with providing support to ISIS, as well as allegedly accepting money to carry out an attack, the Justice Department announced Monday. Mohamed Elshinawy, who lives outside of Baltimore but is originally from Egypt, received at least $8,700 from ISIS operatives overseas and was planning an attack as a sign of loyalty to the group, according to prosecutors. The 30-year-old could face up to 31 years if he’s convicted on all counts. Elshinawy is charged with trying to provide material support to a foreign terrorist organization, obstruction of agency proceedings, and misleading investigators by making false statements and falsifying or concealing material facts… According to an FBI affidavit, Elshinawy began communicating through social media with a childhood friend in Egypt earlier this year and pledged his allegiance to the Islamic State group in February. “He stated that he was a soldier of the State but was temporarily away,” FBI agent David Rodski said in an affidavit. Elshinawy subsequently received at least $8,700 from individuals he understood to be associated with the militant group, at one point pretending to sell printers on eBay as a cover for payments he received through Paypal… When interviewed by FBI agents this summer, Elshinawy initially tried to conceal his support for the militant organization, claiming that he had no intention of carrying out a terrorist attack and instead was scheming to take money from the group, according to the affidavit.